Five years ago, Disney Cruise Line was launched to the delight of young and old everywhere Disney set out to be different from all the rest and they have succeeded in a big way. Because of Disney's family approach, the bar has been raised to new heights in family cruising. In Disney's wake, many cruise lines have since adopted a more family friendly atmosphere. Thus, the family cruising revolution was born. Disney is promising new and exciting changes in the future. We'll be sure to keep you informed. 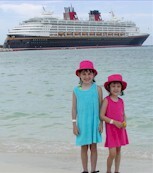 I have been fortunate enough to sail on the Disney Magic… twice. She remains my favorite large ship on the high seas and is the only ship I would sail on repeatedly. Below are two cruise reviews one a three-day cruise, the other a seven-day Western Caribbean itinerary.